1973: The Facility Management Office was a member of the Office of Administration and Accounting of the Technical Education College Center. January 21st, 2005: The Facility Management Office and Projects Management Department were established. The administrative affairs sector was a part of Administration and Management Office. February 20th, 2012: Separated the Management sector of the Management – Administrative Office to merge with the Project Management Department to become the Office of Administration and Project Management. In March 2015, the Office of Projects Management was renamed Facility Management Office. - Advising the President in the facility management of the University. - Organizing activities related to facility management. - Checking the repair of electrical, sound, light devices, making purchases of materials for the aforementioned services. - Checking the care, protection of plants and trees, and other facilities. - Checking the opening and closing, management and hygiene of classrooms, lecture halls, workrooms. - Regularly compiling inventory of the university’s contents, purchasing, storing, distributing, and recalling broken equipment and devices. - Based on the plan, goals of each phase and each academic year to supervise the new fundamental basic construction; Coordinating the authority to inspect and approve construction works; taking charge of the assessment and construction of fundamental construction projects. Senior Lecturer Nguyen Duc Sam (Master): Deputy Head. Nguyen Thanh An (Engineer): Chairman of Sector Trade Union. 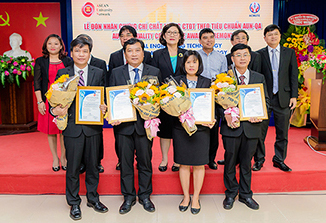 The current list of civil officers consists of 9 people: Nguyen Tan Quoc, Nguyen Duc Sam, Ho Thanh Cong, Nguyen Thanh An, Tran Thi Thu Hien, Nguyen Hoang Thu, Phuong The Lan, Nguyen The Sang, Vu Dinh Chi.